The history of Our Lady of Lourdes Parish in Washington, MO. In the late 1950's Archbishop Joseph E. Ritter saw the need for another Catholic parish in the Washington community. The initial plans called for a temporary Church to be built which would later be used as a parish hall or multipurpose room, and an elementary school. Msgr. George J. Kurtz, our pastor for over 30 years, established our parish on April 10, 1958. At 8:00 a.m. on June 1, 1958, Rev. George J. Kurtz celebrated the first Mass at Washington High School Auditorium. He was officially installed as pastor at the 10:00 a.m. Mass the same day by Monsignor George J. Hildner, V.F., Dean of the Washington Deanery. The groundbreaking ceremony took place June 22, 1958. The cornerstone was laid on Sunday, November 23, 1958 with Monsignor Hildner officiating and Father Kurtz assisting. The church and school was completed in May, 1959 and the first Mass was celebrated in the church on May 31, 1959. The Church and school were dedicated on June 7, 1959 by then, Archbishop Joseph E. Ritter. The school opened in September, 1959. Since then there have been two major additions. In 1967 four additional classrooms were added; and in 1986 six more classrooms and a large multipurpose building were built. The Church structure was to be a temporary building, however it was used as the church for over 46 years. Our parish's dream was to eventually build a permanent church building. On March 3, 2000 OLL pastor, Fr. Robert L. Heimos, wrote Archbishop Justin Rigali requesting permission to begin the process necessary for us to build a new church - which was quickly granted. A committee was formed and the planning to "Fulfill the Promise, Complete the Vision" began. Eventually, the dreams of the founding parishioners came true. After a successful feasibility study, four town hall meetings, several major fundraisers, selection of the architectural firm, general contractor, and construction company, the new church was going to be built. 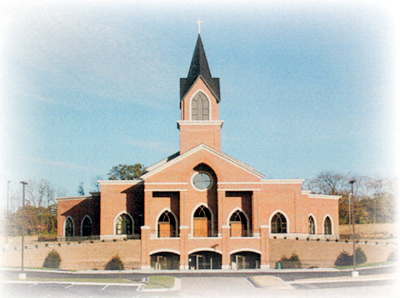 On June 9, 2002, Auxiliary Bishop Timothy Dolan led the celebration of the groundbreaking ceremony for a new church. Fr. Robert L. Heimos, Pastor, oversaw the completion of the church. When all was completed, the official dedication was celebrated with Archbishop Raymond L. Burke on October 24, 2004. On April 6, 2008 a Golden Anniversary Mass was celebrated by Archbishop Raymond L. Burke along with Rev. James Byrnes, Pastor, and Rev. Mr. Richard Boland, Deacon.